Original Palace Photo Booth Donated to Save Tillie! Save Tillie Returns Photo Booth To Asbury Park! This site is brought to you by Save Tillie, an all volunteer organization comprised of 1,000 friends of Asbury Park. 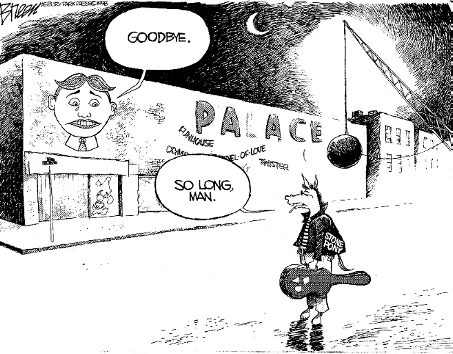 Founded in July of 1998, our original goal of saving the Palace's iconic Tillie image expanded in 1999 to an attempt to save the entire Palace. Under our leadership, the Palace won an honored place on the New Jersey and National registers of Historic Places. Demolition of the Palace in 2004 came over the objections of the National Trust for Historic Preservation, the Asbury Park Historical Society, Preservation New Jersey, and Save Tillie. In the end, we saved more than 125 internal artifacts from the Palace and the Tillie mural from the Cookman Avenue wall, and through our work the Bumper Car murels on the Lake Avenue facade were also removed to storage. THERE'S NEVER BEEN AN ICON QUITE LIKE TILLIE. Tillie – the one, the original – was last seen in public in 2004 upon removal from the exterior wall of Palace Amusements, the National Register of Historic Places complex at the corner of Cookman Avenue and Kingsley Street in Asbury Park. Removal was part of a deal between the State of New Jersey’s Department of Environmental Protection, the City of Asbury Park, and a property sales group to green-light redevelopment of the Asbury waterfront. The project was conditioned upon the preservation and reuse of Palace artifacts, including the Tillie mural. Today, the Madison Marquette development group continues to keep Tillie locked up, out of public view, with no announced plans for its reuse as required by the 2004 agreement. In the view of many, Madison’s goal is allow the condition and visual integrity of Tillie and the other Palace artifacts to decline by neglect. But wait, what’s this? 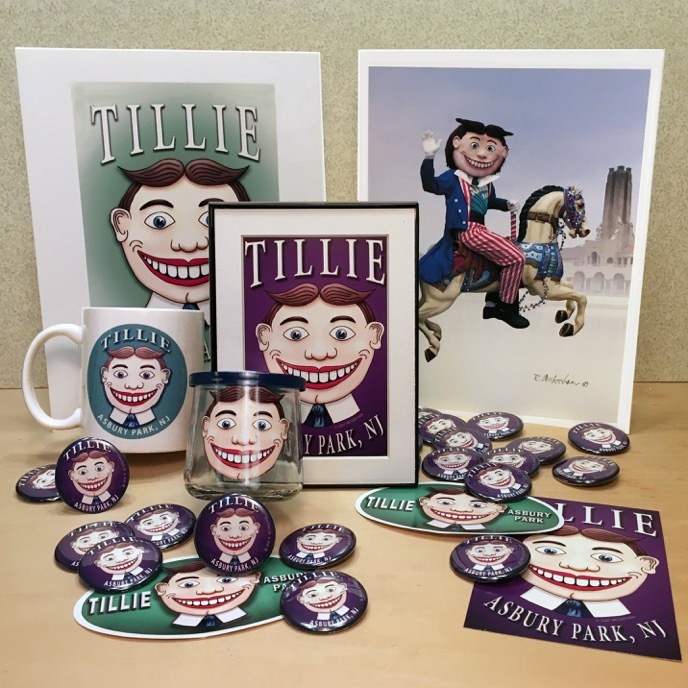 Fifteen years down the road from removal, Tillie is a merchandising force in the shops of Asbury Park and Ocean Grove next door. Take a stroll through the Cookman Avenue business district, or go next door to Main Avenue in the picturesque Ocean Grove, and you’ll find Tillie images everywhere. On photographs, art prints, coffee cups,postcards, tee-shirts, buttons – literally, everywhere! The latest, and to our eyes some of the nicest Tillie items grace the shelves at Main Avenue Galleria, 57 Main Avenue in Ocean Grove, where you’ll find the offerings by artist Ralph McGeehan. McGeehan presents realistic images of Tillie, including a classic photo of a representational Tillie aboard a carousel horse during Asbury Park’s 4th of July parade several years back. If you drop in to any of the shops where Tillie lives on, give a word of thanks to the shop owners including Norma Tolliver at the Galleria for proving that famous icons are an integral part of the community’s future, as well as its past. Unless you’re living under the proverbial rock, you know that pinball is the national pastime of Asbury Park. For decades, silver balls have ricocheted off plungers and bumpers along the Boardwalk, triggering the music of bells, chimes, and beepers that is as indigenous as the sound of the surf. Opening in 2009, Silverball Museum fits perfectly into this tradition: a game room filled with classic machines from as early as 1950, all waiting to be played. Want to try Slick Chick by Gottlieb (1963)? Silverball Mania by Bally (1978)? Pirates of the Caribbean by Jersey Jack Pinball (2018)? They’re all there, and more. Recently, under the curatorial guidance of Silverball’s Dan Toskaner, the Museum has taken an extraordinary series of steps to strengthen its connection to Asbury Park history, acquiring and publicly displaying artifacts salvaged from Palace Amusements, a National Register of Historic Places complex destroyed by developers in 2004. The most recent high value addition is a large plywood sign that hung over the Palace business office inside the complex. On loan from the Asbury Park Historical Society, the sign is an astonishing survivor of the pillage that resulted in the destruction of hundreds of valuable artifacts left behind following the closing of the Palace. The sign is the third Palace artifact to find a home at Silverball, joining a classic photo booth and a metal channel letter “L” with restored neon, originally part of the P A L A C E rooftop sign facing Wesley Lake. Announcing his latest addition, Toskaner said with a smile that it was hung “as part of my continuing effort to collect enough artifacts to put the Palace back together again.” The way he said it suggests that Toskaner has additional plans. We can hardly wait to see what’s next! THEN AND NOW: In its original location, the interior Palace Amusements sign hung over the entry to the business office where, somehow, it miraculously survived the rampant vandalism that destroyed hundreds of historic artifacts in the famed National Register of Historic Places complex. In its new location, the sign hangs from the ceiling at Silverball Museum along the Boardwalk. Big kudos to the guys at The Silverball Museum, that palace of pleasure machines on the Asbury Park Boardwalk! Newly hung from the ceiling, neon shining brightly, is a historic metal channel letter “L” that was once part of the P A L A C E rooftop display above the Skooter Murals on the Wesley Lake side of Palace Amusements. As told by Silverball’s Senior Technician Dan Toskaner, the “L” belonged to Asbury businessman James Kaufman, who hung it in a prominent position in his Flying Saucers store on Cookman Avenue. With Flying Saucers relocating to the Antique Emporium next door, he offered the “L” to Silverball, which also has a Palace Amusements photo booth on display. “We’re thrilled to have it,” Toskaner told Save Tillie. 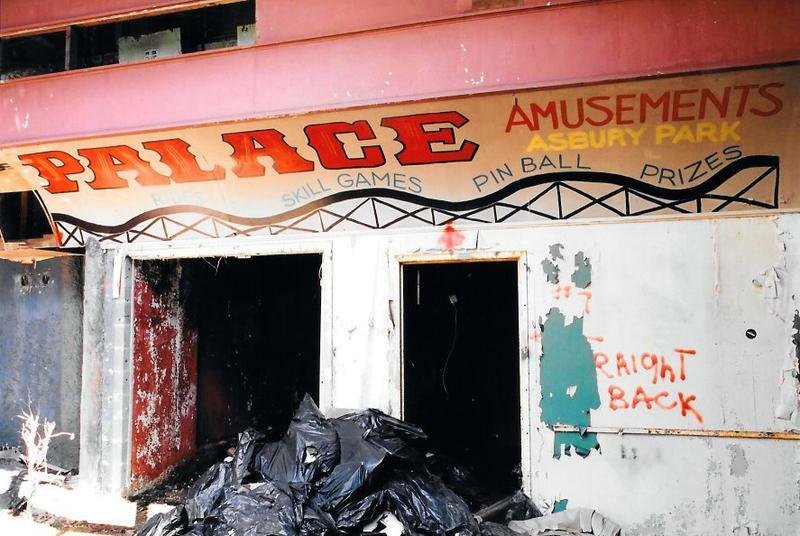 “To us, the “L” stands for “Lives on,” reflecting the attitude of so many about the memory of Palace Amusements. Next time you’re on the Boardwalk, stop by and see it for yourself. It is spectacular in the new location, and makes one wonder why, after all these years, the owners of all the other Palace artifacts – Madison Marquette – is keeping the iconic murals and metal channel letters in storage and out of public display. Oh, and by the way, while being transported from Flying Saucers to Silverball, the “L” made a sentimental ground level stop under its original location along Lake Avenue. ASBURY PARK -- Twenty-nine historic artifacts protected under an agreement between the City of Asbury Park, its waterfront developers and a state agency have deteriorated over the past two years to the point of losing visual and structural integrity, according to a conservator who recently inspected the artifacts. The inspection identified three wall murals that have lost “significant” paint and are “beginning to lose their detail,” and 26 metal letters that are rusting and in danger. “A decision about the final disposition of these important historic objects should be put in place as soon as possible,” said Paul Himmelstein, a New York conservator, who inspected the artifacts in their storage locations along Asbury Park's waterfront. Otherwise, he said, the historic authenticity of the artifacts is in peril. In 2012, three of the protected Palace features were reported lost, prompting the New Jersey Department of Environmental Protect to issue a warning letter containing new reporting requirement to the City and Madison Marquette. Future violations, said state officials, were punishable by fines of up to $25,000-a-day. On November 18, 2016 I carried out another site visit. I examined the murals, still housed in the sheds located at the City’s Sewage Treatment Plant; the metal channel letters and the National Register of Historic Places sign in the 4th Avenue Pavilion; and the wooden cutouts, now relocated to the Sunset Pavilion. Over the past two years, the murals have lost some significant additional paint from their surfaces. Quite a number of new paint chips were observed on the top surfaces of debris located on the floors of the sheds. Some areas of the designs are beginning to lose their details as a result of this paint loss. Additionally, one of the bumper car murals has a horizontal crack. No mold was observed on the surfaces of the murals. The recommendation to paint the exteriors of the sheds has not been carried out, and the outsides of the two sheds look even more “abandoned” than they did previously. No physical barriers on the outside of the sheds have been erected to prevent damage to the sheds from vehicles, as I previously recommended. The metal channel letters had been removed for my examination from a locked room on the second floor of the 4th Avenue Pavilion, which is where I examined them in 2014. The letters show additional rusting on their surfaces. If this continues they will lose their structural integrity. The wood overhead door, with cutouts, previously damaged in Superstorm Sandy, has been moved to a new location in the Sunset Pavilion. The cutouts were covered with a variety of plastic tarps. Since the pieces are quite large, they were not removed from their location for a complete overall examination. Examination in situ showed that the wood has dried without warping, and the cutouts appear to be stable. As discussed in my previous report, the continued loss of paint from the surfaces of the murals will eventually lead to the loss of an authentic surface, and even to the possibility of accurately repainting them. They are now in danger of reaching that point fairly soon. A procedure to arrive at a decision about the final disposition of these important historic objects should be put in place as soon as possible. Debris on the floors of the sheds should be removed so that paint loss from the murals can be monitored. To prevent further infiltration of outside debris through the air vents, they should be lined with metal window screening. A more appropriate covering material should be used on the overhead doors. Tyvek or a similar material should be used. To reduce the rate of rusting on the channel letters the room in which they are stored should be equipped with a dehumidifier attached to a drain. To make this as efficient as possible, the room should be lined with 6ml polyethylene, with the appropriate tape used to secure the edges. This will reduce the load on the humidifier. However, my recommendation regarding the murals applies here as well: a decision about the final disposition of these important historic objects should be put in place as soon as possible. I had inspected the murals in 2005 to review their condition and made recommendations for changes to the structures in which they were stored (see my report of September 2005). On June 19, 2014 I inspected the above items to review their condition and their current storage spaces. Most of my 2005 recommendations for changes in the structures used to store the wall murals appear to have been carried out. One of the suggestions, for physical barriers placed to protect the outside of the enclosures from damage by vehicles has, however, not been carried out. In addition, the outside of the plywood is somewhat deteriorated, and the sheds look “abandoned.” My initial recommendation to paint the outsides and maintain a “cared-for” appearance is still an important issue. Vandalism is less likely to occur if the sheds look like someone is taking care of them. Since my inspection in 2005, the murals have remained in the storage sheds outside the City’s Sewage Treatment Plant. There was some evidence of water staining in strips at the bottoms of the murals, probably as a result of water intrusion during Sandy. The water does not appear to have done any substantial damage to the blocks or paint. There is no evidence of mold growth on the surface of the murals. The high density cinder blocks on which the murals are painted and the mortar between the blocks appear to be in fairly stable condition. There is minor evidence of cracking and structural deterioration; these conditions should be frequently inspected. However, it appears that there are some new paint losses. Although the recent losses are small, the process of deterioration is continuing. The more losses that occur, the more difficult it will become to reconstruct the original design. Regular examination is essential to determine when the continuing loss of paint (and resulting loss of significant details) would jeopardize the ability to repaint the murals in accordance with their original appearance. The metal channel letters and the National Register of Historic Places sign are stored in a locked room on the second floor of the 4th Avenue Pavilion. The overhead light fixture in the storage room was inoperative, so I did not attempt to count or examine all the metal channel letters (of which there are supposed to be 26.) While there is evidence of some rusting, in general the letters appear to be stable. Along with the letters, the room contains some original lighting fixtures and other historic artifacts from properties other than Palace Amusements. An inventory of all of the items in the room should be created, and signed by all parties involved. This would help to confirm that all items that are now stored there remain in the room. The wooden cutouts on the overhead door are stored in a ground-floor area of the Casino Arcade Building. The lower portion of the cutout I examined appears to have been soaked during Sandy, and the wood at the bottom shows considerable deterioration. Further deterioration would likely lead to substantial instability of the entire assembly. Because damp wood is a magnet for insects, the cutouts should be moved to a dry location, and should be raised off the floor for storage. A complete restoration of these cutouts in the future would be possible only if the appropriate steps are taken now to slow the continuing deterioration. Finally, a regular inspection schedule (at least once a year) of the objects in storage, by a conservator, should be established. This will help to assure that minor condition problems do not turn into major ones. Murals - "Tillie" and "Bumper Cars"
On August 18, 2005 I inspected three murals removed from the Palace Amusements complex in Asbury Park, NJ and now stored in enclosures in the parking lot of the Asbury Park sewage treatment plant at 8th and Ocean Avenues. The murals were executed on outside walls of the complex. The walls were constructed from high-density cinder blocks and their appears to be a coating, perhaps stucco, over the cinder block surface. The paint appears to be an oil-type. To facilitate removal from their original locations, the murals and the cinder block walls on which they were executed were cut out and surrounded with steel frames. The frames were reinforced with welded steel cross braces that are about an inch from the surfaces of the murals. The murals are now stored in two sheds constructed from 2x4s and plywood. The plywood was nailed to the 2x4s and caulking was been applied to the outside of the plywood joints. The plywood was reportedly “recycled” from another site and is not in very good condition. It was unclear from visual inspection whether the plywood is “marine grade” (i.e. manufactured using non-water-soluble adhesives) and therefore suitable for exterior use, or not. Peaked roofs were added to the sheds sometime after their original construction. These additions sit on the sheds, but the interiors of the two portions do not communicate with each other. The sheds sit directly on the asphalt of the parking lot; there is no “floor” to either of the sheds. One section of plywood had been removed from each shed to permit my inspection. The sections were located at the bottom of each shed on the painted side of the murals. (The two portions of the “Bumper car” mural are stored back to back in a single shed so two sections were removed on this shed.) Judging by comparison with detail photographs, the condition of the murals appears not to have changed in any substantial way from that immediately after their removal. The paint is quite brittle and is curled away from the surface in many areas, and there are scattered losses throughout. There were only very small pieces of paint on the ground inside the sheds, indicating that no substantial losses had occurred since the murals were enclosed. The murals and their supporting walls should not be substantially affected by changes in relative humidity (RH) and temperature, although changes in RH might cause some efflorescence of any soluble salts that may have entered the mural structures due to their proximity to the ocean. The two agents of deterioration most likely to cause damage to these works of art during storage are mold and staining from rusting of the steel frame and braces. In addition, physical damage from blows to the outside of the sheds could cause substantial damage. Mold is most likely to grow when three conditions exist: still air, darkness and high relative humidity. Rusting has already occurred on the surface of the steel, but no rust has reached the surfaces of the murals. A truck backing up in the lot could also cause a catastrophic loss of one of the sheds and its enclosed mural. • Physical barriers, perhaps concrete highway barriers, should be installed on the lot sides of the two sheds. • Ventilation grills should be installed at the bottom and top of each shed to allow air to circulate within the sheds. These grills should be sturdy enough to prevent birds and curious people from gaining access. The grills should be backed up with standard home furnace filters to prevent larger particulate matter from entering the sheds. Two sets of grills should be installed on each shed, on opposing walls. Care should be taken so that wind-driven rain will not be able to enter through these grills. • The roof structure of each shed should be rebuilt so that the roof overhangs the shed on all sides, and appropriate flashing should be installed. It is essential that no liquid water penetrate into the interior of the sheds. Any liquid water that lands on the steel is likely to run off and cause staining of the painted surfaces of the murals. Such staining would be almost impossible to remove. • As agreed on site during the inspection, the walls of the sheds should be rebuilt, using screws (rather than nails) and appropriate gaskets so that the structures are waterproof and long lasting. In addition, hinged doors with appropriate locks should be installed to permit easy regular inspection of the mural surfaces. • The condition of the plywood should be monitored. Any panels that deteriorate to such an extent that they compromise the safety of the murals should be replace at once, using plywood rated for outdoor use. • It would improve the security of the sheds if they were painted to look more like permanent components of the treatment plant. At present their makeshift appearance invites vandalism and careless handling. With the above changes and safeguards in place, I believe these murals can be stored safely in their present location. Regular quarterly inspections would help to insure that the murals continue to be in stable condition and protected appropriately. Want a Tillie? Check out the display of items by Ralph McGeehan at the Main Avenue Galleria in Ocean Grove.